You've probably never heard of Thad Roberts or if you have, you probably know him as the man who stole the moon. (He literally stole moon rock from NASA to give to his girlfriend and served jail time for it.) 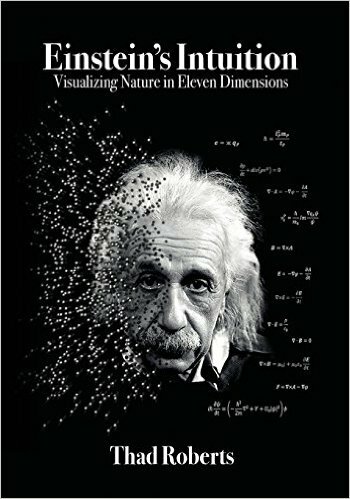 Indeed, Thad Robert's intriguing character resounds soundly in Einstein's Intuition as he begins many chapters describing what he was doing when he was thinking of ideas presented in the book. He might have been manning a space flight, digging for dinosaur bones, or swimming with dolphins. My favorite anecdote of his describes the day he and his fellow prison mate built a snowman, despite possibly getting put in "the hole" for doing so. The overseeing guard who was a control freak battered it down with a baseball bats. Eventually a dozen of the prisoners built a giant ice sculpture that rose sixteen feet and spanned ten feet with a three-foot snowman on top. They poured buckets of water on the pillar, so that it froze into ice. When the prison guard tried to attack "Frosty," his attacks escalated to plowing a truck into the pillar. It damaged the truck and not the pillar. Needless to say, Thad caught my attention. His feisty, robust, and unique personality resonates throughout his 452-page book. He covers a lot of ground, so bear with me. The two most important ideas he presents are that the universe is actually eleven-dimensional rather than four-dimensional and that space (or vacuum) consists of a quantized superfluid with a hierarchical fracture structure. Before describing the eleven dimensions, let me share what for me, was a salient argument for why there have to be more dimensions than just our typical four (three in space, one in time.) If we take a point in space, it has no dimensions, that is, it has no length, width, or height. If we take a line, it has one dimension. A plane has two dimensions. And a cube has three dimensions. But if we were to try to stack as many planes as we wanted to make up a cube, we could never transfer over into the next dimension because planes have zero height. Therefore, a point in space, or what Thad calls a quantum, must have dimensionality. If each point in space has volume, then we have to add three dimensions within each space quantum and three dimensions to describe the space between quanta. So now we're up to ten dimensions. He also postulated a second time dimension on the quantum level. Without this eleventh dimension, we would only get static snapshots of the space quanta in motion. Thad predicts that what we previously thought to be incomprehensible -- conceiving past four dimensions -- is actually pretty straight forward. And he's right. The real mind-bender is grappling with how space can be particulate. A superfluid is matter that behaves with zero internal friction and zero entropy. In other words, it has the "ability to flow without dissipating energy." I think the "hierarchical fractal structure" refers to the eleven dimensions embedded in one another, but I'm not entirely sure. My complaint is that Thad seems to think that these two concepts are so simple and straight forward, that he devotes most of the book to the implications of these ideas rather than explaining these ideas. Another complaint is organizational -- he doesn't describe superfluids until nearly two-thirds of the way through the book. I was unfamiliar with superfluids as a concept until reading this book. So I'm left struggling with -- why is it a superfluid rather than a gas or a fourth state of matter? How can a superfluid be less dense than the gas particles of matter? If it's not less dense, how can it still be thought of as a vacuum? I've always struggled with the atomic theory of matter. If we take our bodies, we have systems and subsystems. We have our bodies as wholes. We have organs within those bodies. We have cells within those organs. But each of those subsystems has discrete boundaries. A surgeon can remove a heart from a body and identify it as a particular "thing." Subatomic particles seem a lot more imaginary to me because they have less discrete boundaries. An atom, for example, is made up of a nucleus and spinning electrons. Therefore, it seems more like a system of interacting parts than something you can easily partition off from other things. Electrons may be fundamental particles, but protons and neutrons are made of quarks. So are protons and neutrons really distinct things? So, when I have difficulty conceiving of this "thingness" of what we traditionally think of as matter, I have even more difficulty conceiving of the "thingness" of what we traditionally think of as space. If we have space within us, how can there be space within space without some kind of material boundary to demarcate inter- and intra- space? If there is a physical boundary, it seems like it is no longer space. This is what I have difficulty wrapping my mind around and I don't feel like Thad explains it well enough to really get it. But! There are all sorts of cool implications of this theory. One is an explanation of the notorious wave-particle duality of matter. Prince Louis de Broglie did an experiment where he put two slits through a wall and passed a single photon through one or both of those slits. Rather than appearing as a point in the wall like it does when only one slit is open, the light shows up as a wave interference on the wall. Scientists have puzzled over this, wondering if the photon somehow passes through both of the slits. Even more confusing, if the experimenter ascertains which slit the photon passes through, it no longer shows the wave function. Scientists have wondered if this means by measuring it, they have fundamentally altered the nature of the problem. Thad's theory breaks through all of this. He says that the light particle is still a particle, but the wave-like properties are demonstrated because the quanta of space are interfering with the particle. This seems brilliant to me! A more disturbing consequence of his depiction of physics is that everything is deterministic. This is satisfying as a physical explanation because it means that everything has an explanation if all the parameters are known. But it is disturbing because he extends it to human behavior. In his model, free will is illusory. Everything we have ever done can be explained by the properties of the systems we are engaged in. Even more disconcerting, in the other universes required to explain the birth of this universe, we are doing the exact same things that we are doing in this universe. Nietzsche's eternal recurrence is no longer a mere thought experiment, but an accurate descriptor of how the omniverse operates. I find this a hard pill to swallow. Another really interesting claim is that the universe has not reached maximum entropy and so does not yet seem time symmetric. When it does, Thad claims that we will no longer have the capacity for making memories! I love how innovative Thad's ideas are. They feel like they are on the cutting edge of science. However, I feel like he gives too brief explanations of some of the core ideas because he sees them as straight-forward and because he is trying to cover so much ground. I recommend skipping the preface. Unlike the rest of the book, it is slipshod as if it were written too quickly. Most of the text is engaging and easy to understand. He includes some math, which I didn't understand, but was glad it was there for those who are more versed in the field. This book is a good cure for narrow thinking. Even if you aren't persuaded by his model, it will definitely get you thinking of alternatives to the traditional viewpoint. He says that as long as it provokes independent thought, he will have accomplished his goal. please visit my web site www.timeflow.org . I will be indebted for your interest. In truth, Thad stole the moon for his wife, Katie. Not his girlfriend. FACT. Regardless, it is a romantic story interwoven with James Bond-like sequence. I adore Thad’s story because of difficulty he faced, the hardship he bravely endured and the joy he purely lives today. He has a brilliance I will never understand yet a manner of teaching so approachable, even to children. Thad speaks to me as a human, in the most gritty manner. I will love this man and be grateful to him until the end of boundless time.